Today, I’d like to share with you one of my most recent client projects. 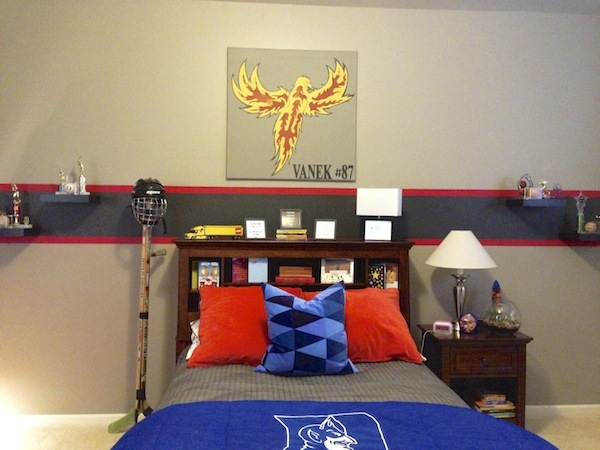 My client was an 11 year old boy with a love of the NC Blue Devils, legos and hockey. 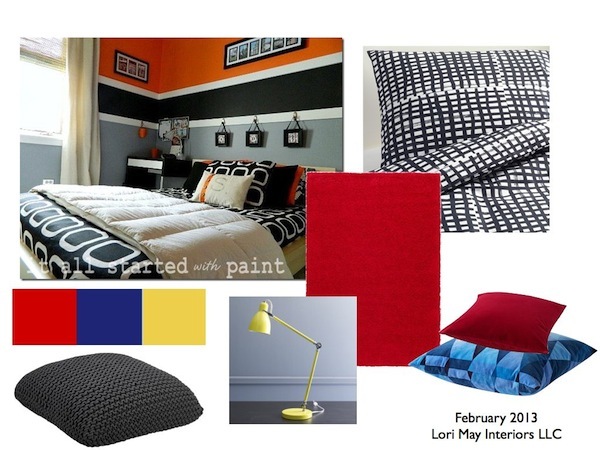 My challenge was taking all of his favorite things and all the different colors and designing a room that would feel pulled together and organized. I took these 3 photos on my first visit. We talked about what he wanted to keep and what we could clean out. Most of the furniture was new, so we decided to keep almost everything. Between the Blue Devils and hockey, I had an existing color palette of yellow, blue and red to work with as well as a very tall ceiling. How do you bring all that together and keep everything within our modest budget? Let’s start with the design plan. You can see that I really wanted to add stripes to the room, so I gave them several options. This plan is a great example of how I like to work with my clients. We took the design plan and modified it to work for them. My young client did not like the yellow lamp or the graphic bedding, so we went with his existing lamp and solid bedding. The plan, however, is still the guide for the overall feel of the room. 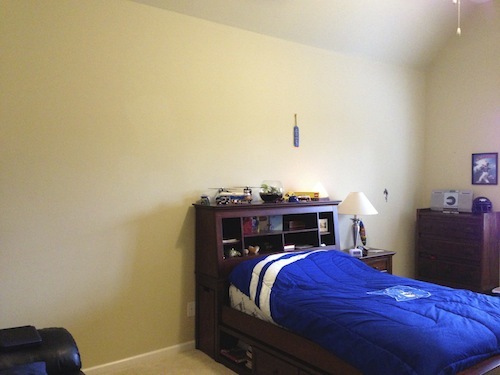 I decided to use paint to unify the strong colors in the room. Gray walls and a charcoal and red stripe brought a new focal point to the room taking the focus away from that tall ceiling. 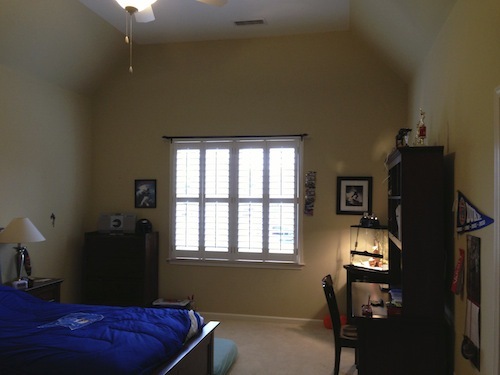 Solid white window treatments softened the plantation shutters without taking anything away from those great stripes. 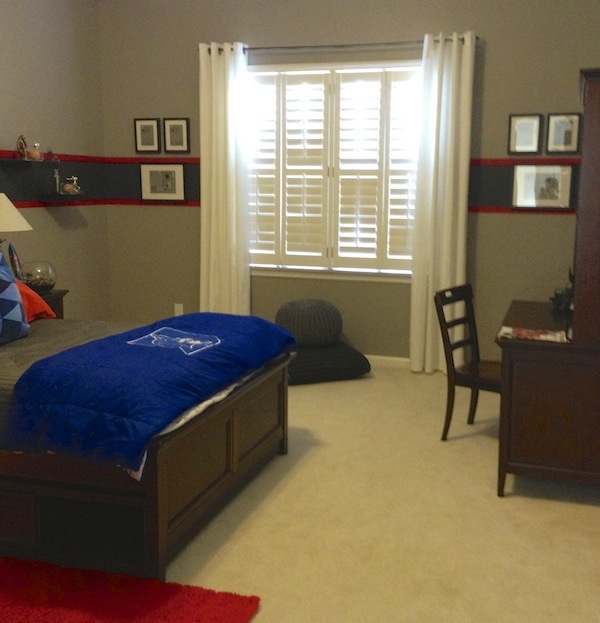 I used red, blue and gray bedding to continue the color palette from the walls to the furniture. 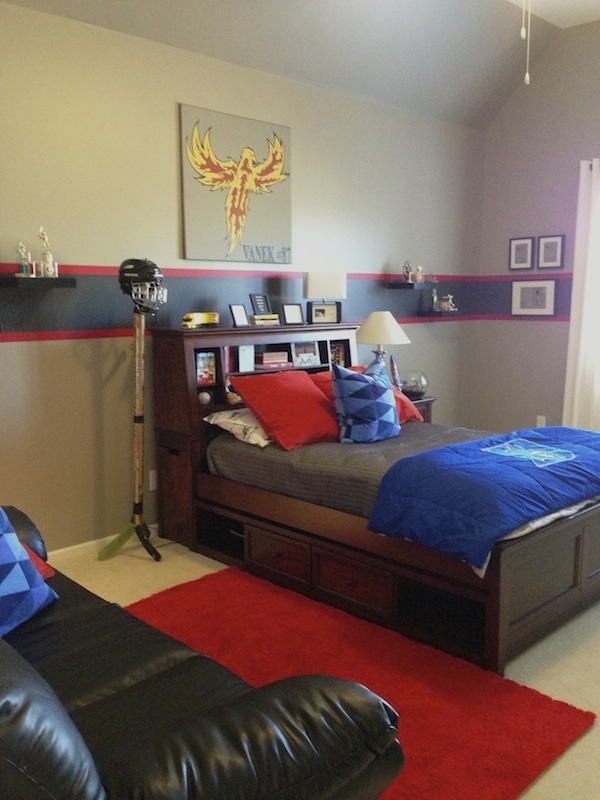 The artwork above the bed is a hand made plaque of my client’s hockey mascot. I also added small shelves to hold his trophies and baseballs. These shelves blend into the charcoal stripe. They are functional, but do not overwhelm the space. The lamp to the left of the bed was designed by my client’s mom. How talented is she? She had seen this lamp in a local store and decided to take on the DIY project. I think it turned out great! 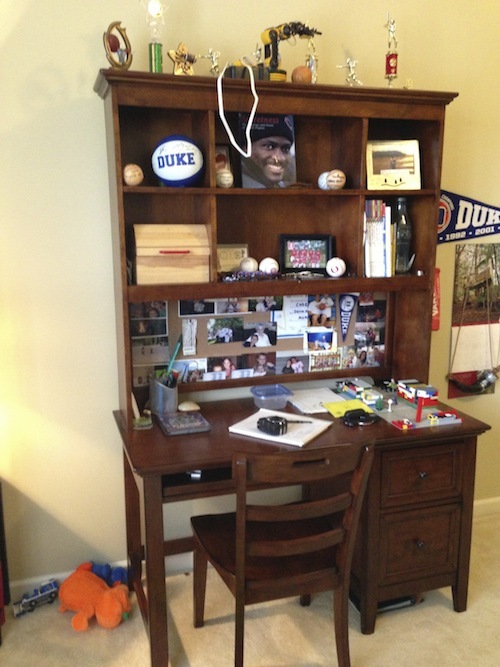 The desk area was decluttered and organized. 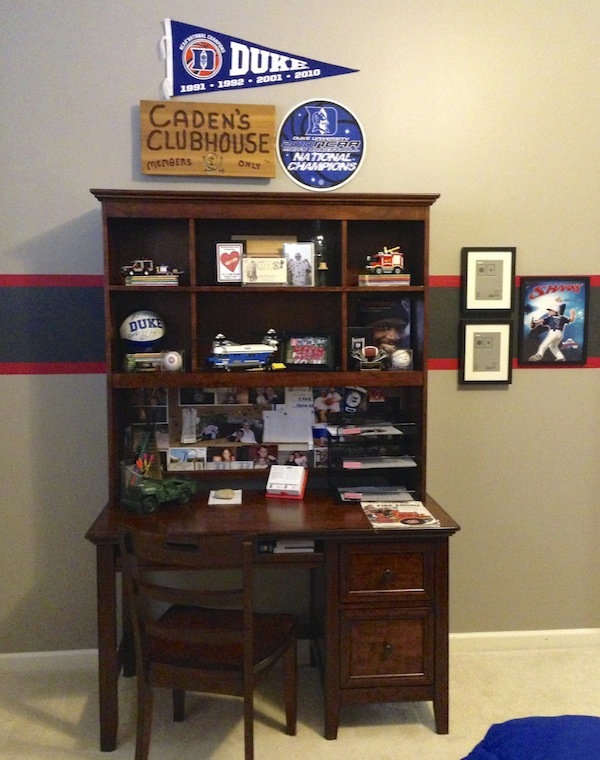 I took some of my client’s memorabilia and created a small gallery wall above the desk. Remember that a gallery wall does not always have to be full of photo frames. It’s a great way to organize your collections and artwork. Here’s another shot of the before. I love how it turned out. 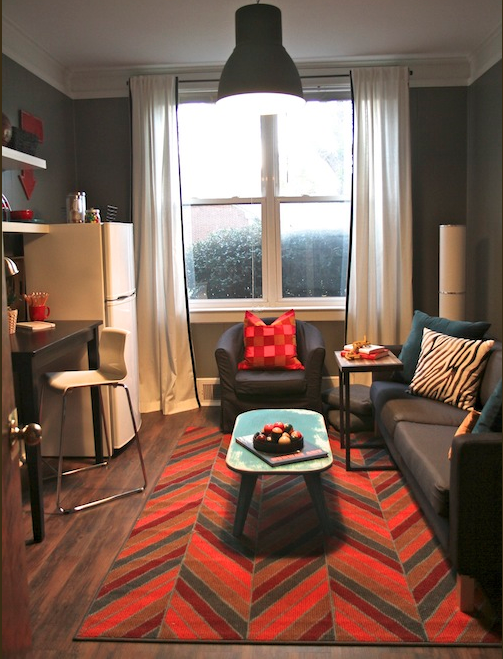 This project definitely shows how you can take a small budget and still make big changes. This image showed up in my inbox a few days ago and I have been obsessed with tapes and trims ever since. These fabulous options are from Mary McDonald’s new line for Schumacher. 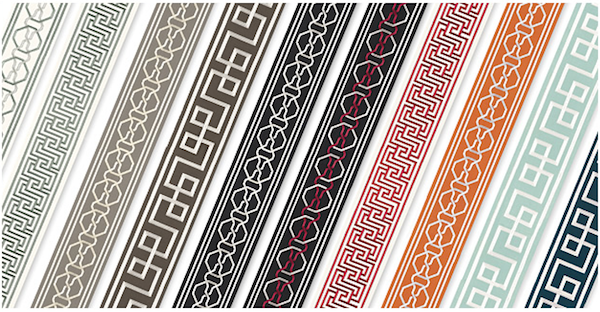 I’ve always known that you can dress up your window treatments with beautiful tapes, but it seems like I am seeing them everywhere lately. 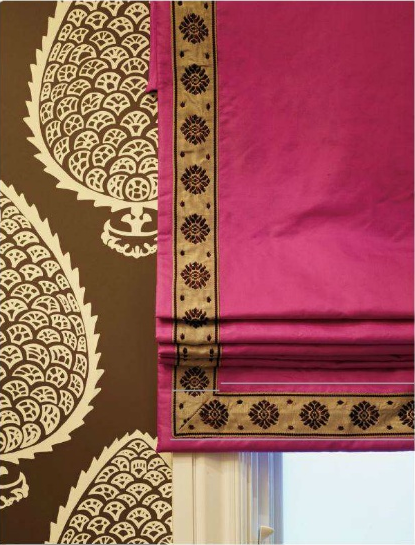 Let’s look at a few ways you can dress up custom or ready made window treatments. Another look at Mary McDonald’s line. 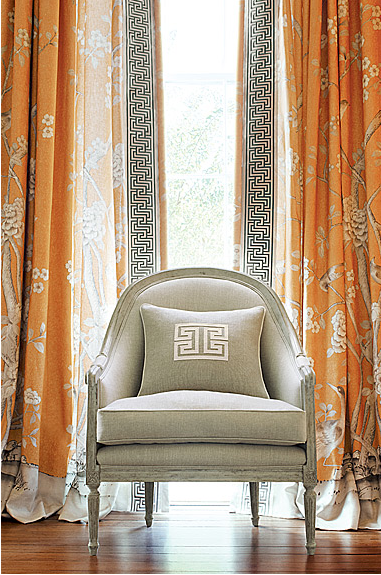 She used a very wide trim here, but what a dramatic touch it adds to those beautiful orange panels. This is a much more simple look. Many of us use solid panels. Adding a simple solid trim in a pattern dresses them up nicely. Love how the trim finishes off the edges of these ikat panels. 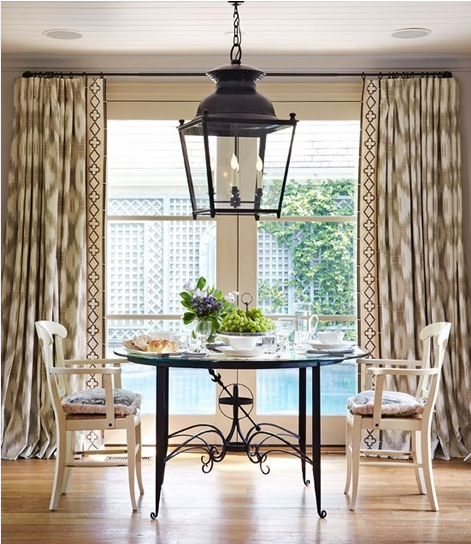 Can you see how the trim pattern brings out the antique bronze of the table and the lantern? It’s a subtle detail that makes a big difference in the space. Another dramatic look. Plain white panels would not have had the same impact in this room. …glued on. 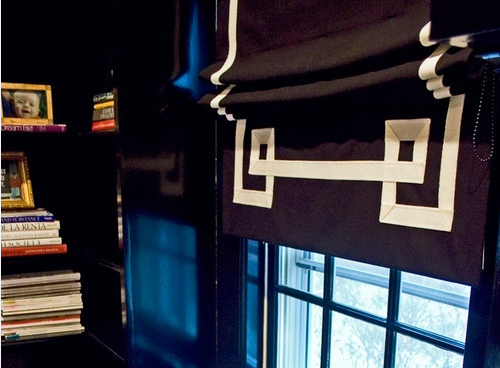 I used fabric glue, black grosgrain ribbon and ready made panels from Ikea to create these window treatments for our last Room Service project. It was so easy and added a nice detail to the white panels. 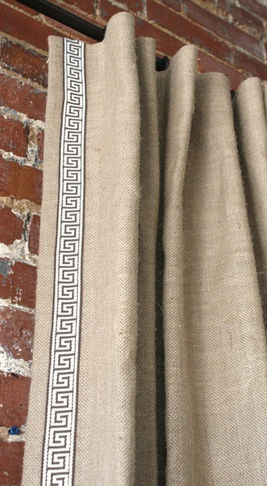 Trims can also be used on Roman blinds. I love the light trim on the dark fabric. 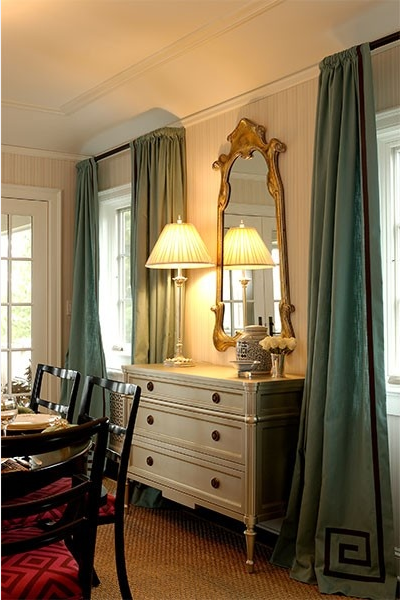 This trim adds a traditional flair to an otherwise non-traditional color palette. 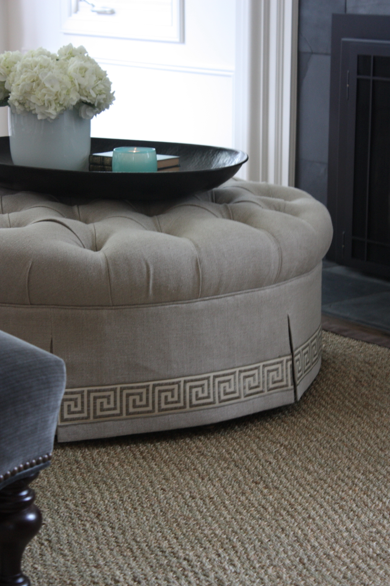 Finally, trims and tapes are not just for window treatments, added to this tufted linen ottoman and you have a completely custom look. I hope you have gotten a few good ideas that you can use in your own projects. 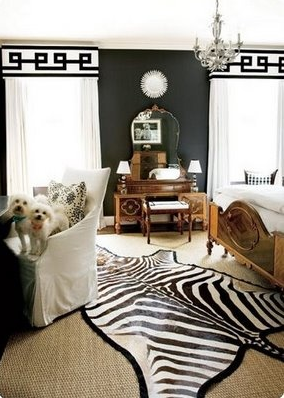 I’m already thinking of how I can use trims in my own home!